I don’t actually own this one but I would love to. The footage for my review came from online. 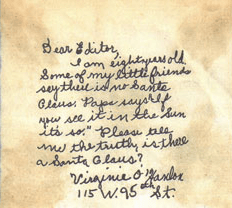 However, of the fictional tellings of how Virginia O’Malley was driven to write to the New York Sun and ask her famous question, this is my favorite. So this year you get an obscure Christmas special I don’t own. We’ll see you for some big projects in 2016 so Merry Christmas and Happy New Year from The Clutter Reports. I don’t know what I’m going to do next year since what I’m reviewing over at the other site THIS year is something that doesn’t have a DVD release and I never owned the VHS. I’ll worry about it next year. 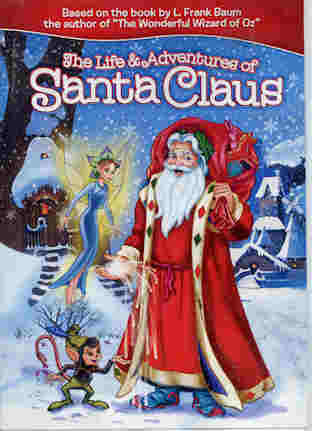 There are two adaptations of L. Frank Baum’s The Life And Adventures Of Santa Claus, a more fantasy-style spin on the origin of Santa Claus. In passing I mention the Rankin/Bass version (their last stop-motion Christmas special) before reviewing the version I like better, a more recent animated version from Universal and Mike Young Productions. So why did I search so hard to find this one? Time to tune in and find out. This is the set I was going to review until a couple of weeks ago. The set is composed of a Snoopy bank (that used to contain candy), some reindeer Christmas tree decorations I found at a dollar store (a big tree, not mine), and a Rudolph the Red-Nosed Reindeer action figure, which will be part of today’s final Christmas review. For years this was the only Santa sleigh display I could find. Nowhere I looked had Santa on a sleigh being pulled by “eight tiny reindeer” with or without “Rudy in the lead” (if you know your Christmas stories and carols). That was until a few weeks ago when this showed up in a Toys R Us. Released by a company called “Forever Fun“, who put out a whole mess of Rudolph memorabilia this year, “Santa’s Musical Sleigh” boasts a flying rig that is supposed to make the sleigh and reindeer appear to fly, that connects to a base that plays the famous song, using the instrumental from the famous Rankin/Bass Christmas special (which also happens to be my favorite Christmas special, apologies to A Charlie Brown Christmas). The set features Santa, the sleigh, the presents, and all nine of the reindeer. So how good is this set?